A newly discovered bug in Apple's iOS mobile operating system is being exploited in a prank that lets anyone crash your iPhone or iPad by just sending an emoji-filled iMessage, according to several reports. YouTube star EverythingApplePro published a video highlighting a sequence of characters that temporarily freeze and restart an iPhone, which people can send to their iPhone buddies to trouble them. You can watch the video demonstration below. Here's the first troublesome text: A white Flag emoji, the digit "0" and a Rainbow emoji. This simple numeric character, flag, and rainbow emojis confuse iOS 10 devices when it tries to combine them into a rainbow flag. As soon as this text is received, the iPhone's software attempts to combine the emojis but fails, and the messaging app crashes and eventually reboots in a few minutes. The recipients do not even have to open or read the message. Another iPhone-crashing method involves the same characters, but saving them as a contact file and then sending that file to an iMessage contact via iCloud's sharing feature. This, in turn, will crash the target's device, even if the victim has not manually opened the file. Both the methods mentioned above will crash and iPhone or iPad to varying degrees, although the simple text string sent via a standard iMessage appears to affect iPhones and iPads running iOS 10.1 or below. 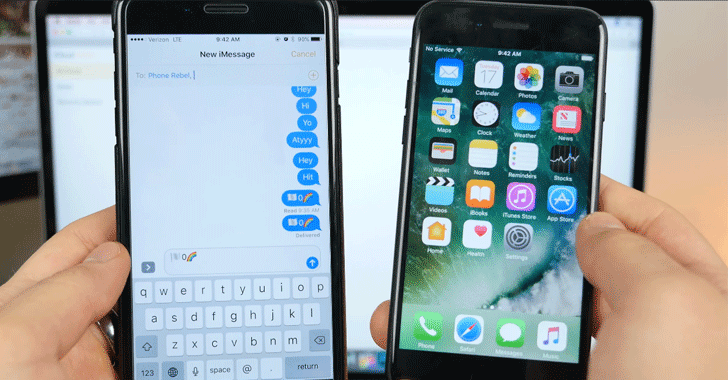 However, the boobytrapped contact card affects all versions of iOS 10, including Apple's latest iOS 10.2 operating system. There is nothing you can do to protect yourself against this issue, as these iPhone-crashing issues have the ability to crash and reboot your iPhone or iPad without your interaction. So, we hope that Apple releases a patch quickly to plug the issues, though the company has declined to comment on the issue. This is not the first time EverythingApplePro has shared iOS-crashing issues. The YouTuber has a long history of reporting on iPhone crash pranks.